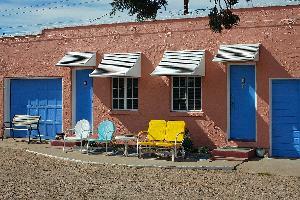 Listed on the National Register of Historic Places, the Blue Swallow Motel is a treasure on Route 66. Construction began in 1939, and the motel opened soon after, and a cafe was also operated on the site. 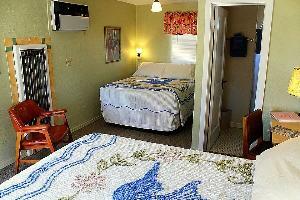 The motel is a typical motor court of the era, built with attached garages next to each room. 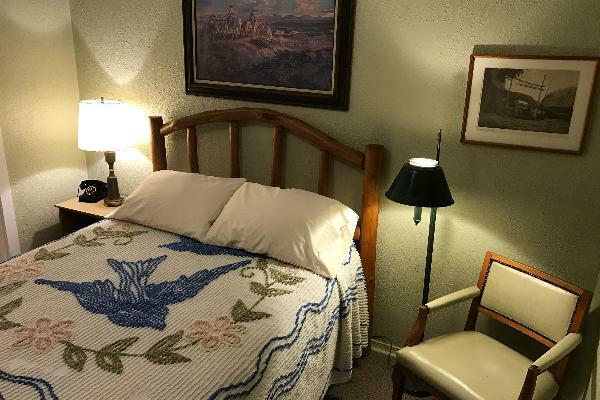 We feature a variety of sleeping configurations, including single queen beds, two double beds, a two room suite with beds for up to five people, and a special two-room suite named after long-time owner Lillian Redman. Nights under the famous neon lights have been described as "magical", and an experience that is not to be missed. 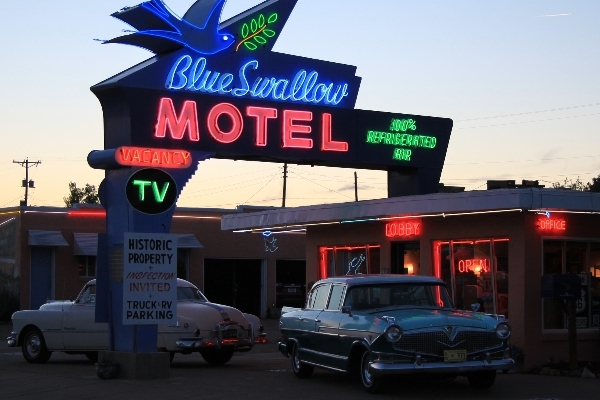 An overnight stop at the Blue Swallow Motel is sure to be a highlight of your Route 66 adventure! The fabulous neon sign of the Blue Swallow. 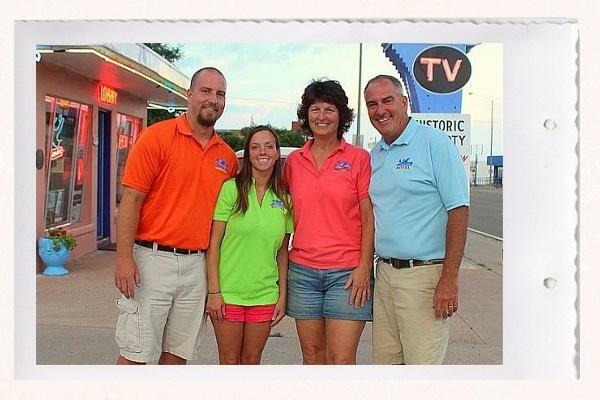 Your hosts, the Mueller family, will be happy to welcome you to the Blue Swallow! From left, Cameron, Jessica, Nancy, and Kevin. Each room features unique, authentic period decor, including chenille bedspreads, vintage lighting, and rotary-dial phones from 1939. 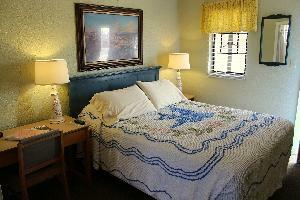 Some rooms at the Blue Swallow have two comfortable beds. 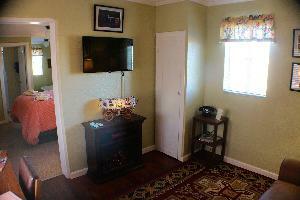 Period charm with modern conveniences, such as cable TV and wireless internet. 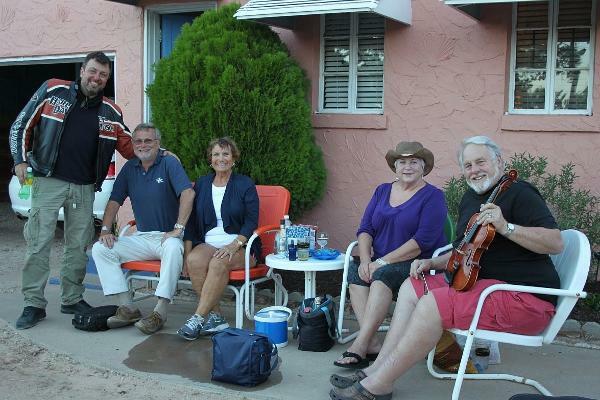 Meet your fellow travelers and make new friends during your stay here. 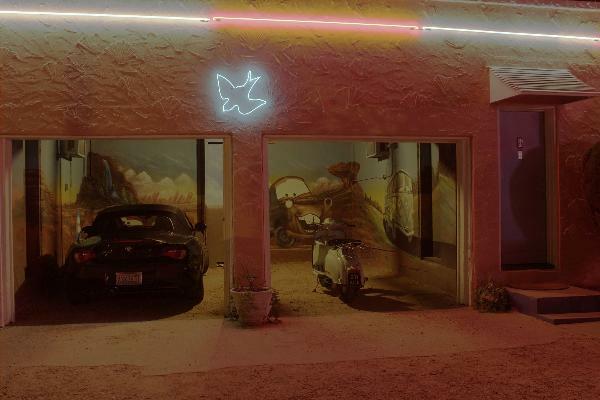 In authentic "Motor Court" fashion, most rooms at the Blue Swallow feature the original attached garages. Architectural neon abounds. You'll be amazed at the colors! 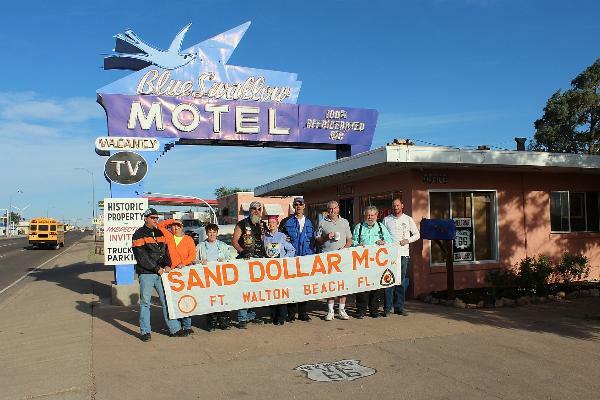 The Blue Swallow is a popular stop for groups. Comfortable and historic, each room features unique decor and a queen-sized bed. Each room has a desk, plus an area to sit and read in. Our doubles feature 2 full-sized beds in comfortable, nostalgic surroundings. Room 10 is unique, with a queen bed and full-sized bed. Each room has a desk to work or read at. The spacious Family Suite has two bedrooms and three beds, including two queens and a pull-out sleeper sofa. Sleeps up to 5 people. The Blue Swallow was built in 1939, and is still fully operational in it's original "motor court" configuration, complete with garages attached to most rooms. Each room features unique vintage decor that harkens back to the 1940's and 1950's, they heyday of Route 66 travel. The neon display is second to none on Route 66, with the amazing neon sign beckoning travelers to stop and spend the night. 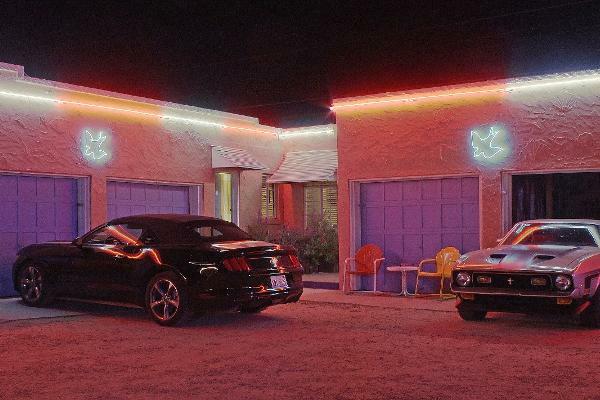 Neon is abundant all around the property, including a neon blue swallow over each pair of garages, and a replica of the original Blue Swallow Court sign. 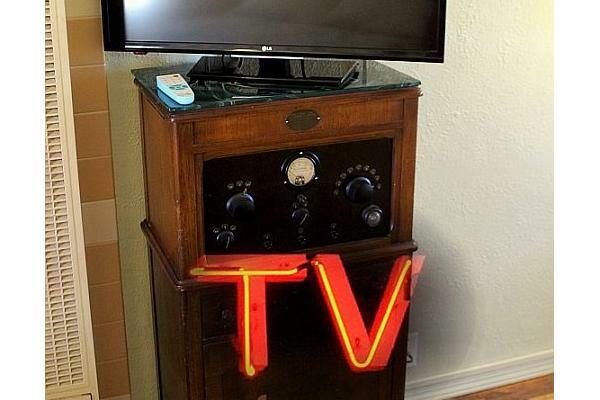 Comfortable beds, clean and quiet rooms, plus the relaxing atmosphere of the glow of the neon ensures a good night's sleep at the Blue Swallow Motel. 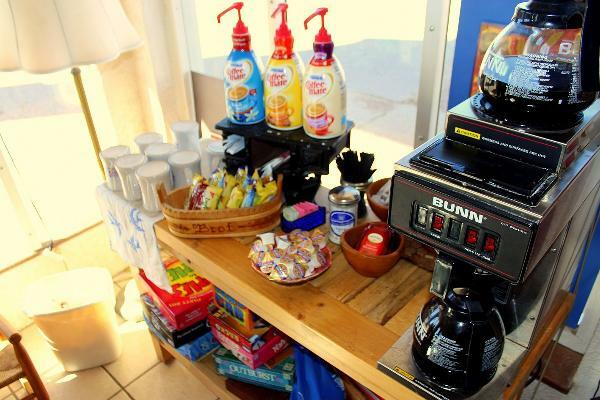 Tucumcari has many sites of interest, that can easily keep visitors busy for a day or more. Museums include the Historical Museum, Mesalands Community College's Dinosaur Museum, New Mexico Route 66 Museum, and Railroad Museum (located in the restored 1927 Rock Island depot). There are artistic and realistic murals painted on buildings all over town, most done by local artist Doug Quarles. The historic Odeon Theater, listed on the National Register of Historic Places, still shows movies nightly at 7:00pm. Taxes charged include New Mexico Sales Tax and Tucumcari Lodger's Tax. Check-in between 3pm and 9pm Mountain time. We do not allow check-ins after 9pm. If you choose to arrive outside of these times, you may forfeit your reservation and may also be charged for the night. All Rooms are strictly non-smoking. Smoking in a room will result in a minimum $150 charge, plus any damages and/or cleaning expenses. Convenient smoking areas are available outside each room. Please use the ashtrays provided. Unauthorized pets in any room will result in a minimum $150 charge, plus any damages and/or cleaning expenses. Cancellations (Reservations dated November 1-February 28) Cancellations made within 24 hours will result in a full one-night charge. No-shows will result in a one-night charge. Cancellations (Reservations dated March 1-October 31) Any cancellation will result a $35.00 cancellation fee. Cancellations made within 24 hours will result in a full one-night charge. No-shows will result in a one-night charge. Please understand that with a limited number of rooms available and high demand, we have turned others away while holding a room for you. Thank you for your consideration!